We have had little to complain about this Winter. There’s been plenty of moisture with little flooding and virtually no snow, and Steve has enjoyed an entire season without having to chuck ice chunks out of the creek in order to let cars through. Still, while we promised not to whine, we’re becoming a bit impatient for Spring. 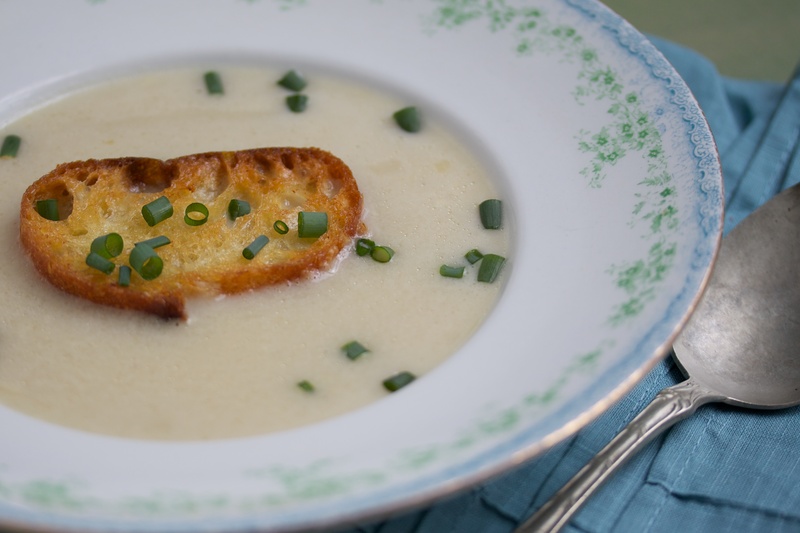 Michelle spent this weekend cleaning our pantry and refrigerator, and decided to use some aging potatoes and a bit of celery root to make this light, creamy soup. It’s delicate yet quite filling, especially with a baguette crouton floated on top. 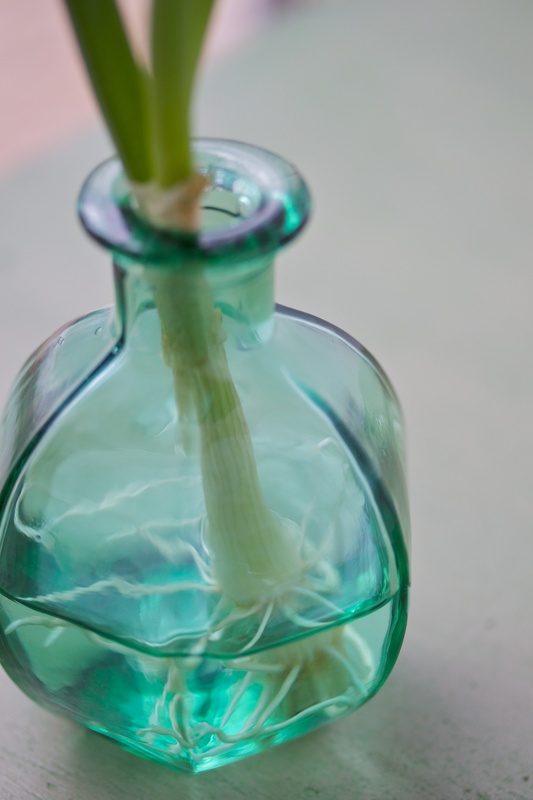 We spiked our bowls with snips of some scallions we have sprouting in windowsill vases—tiny, tingly tastes of what we hope will soon be the greening of Gourmandistan. It works pretty much like the sweet potato you sprouted in grade school. Cook onion in butter in a large pot, stirring occasionally, until fully wilted and just starting to caramelize. Add garlic and cook a few minutes more. Add celery root and potatoes, then stock and bay leaf. Bring almost to a boil, then turn heat down and simmer, covered, for about 30 minutes, until celery root and potatoes are soft. Return purée to pot. Add cream. Stir to combine. Season with salt and pepper. 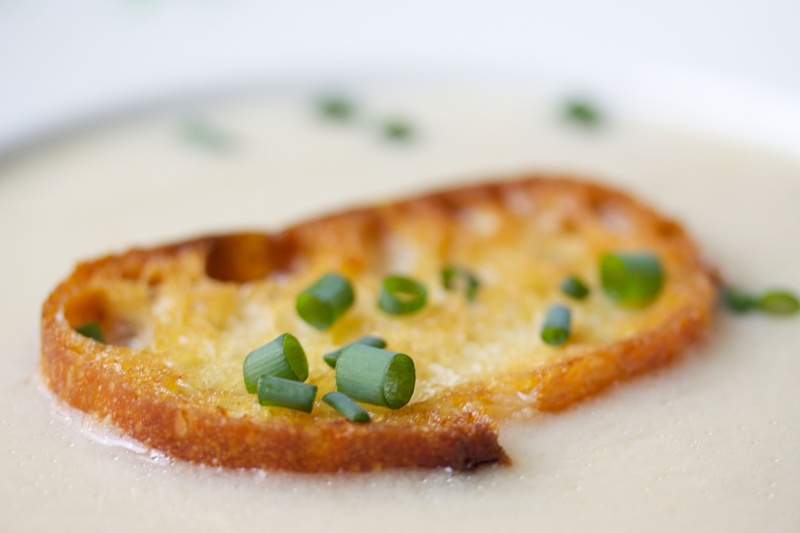 Garnish bowls of soup with buttered and toasted bread slices and snips of scallions or chives. 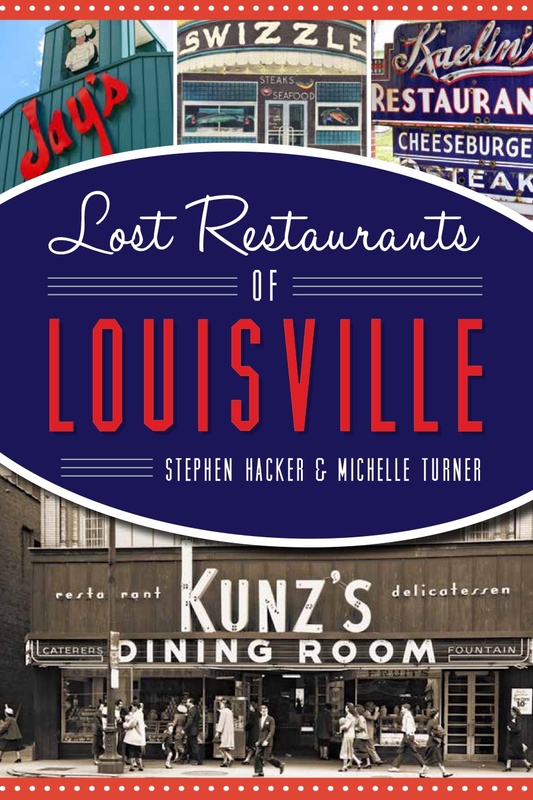 This looks just perfect – and your pictures are gorgeous! The floating toast shot is beautiful and I very much like celeriac, which I use constantly in the winter months. Thanks—and see how frugal I was to save the wilted scallions from the compost! Lovely – I adore the taste of celery, so fresh! Yummy! I love the sprouting scallion…it is so beautiful and strangely calming to look at. I have been looking at it for a while now. And no, I did not consume any psychotropic substances. It is just really pretty! I realized I have not visited in a long time!